Using a baby shower checklist is one method you can use to help keep yourself organized when it comes to a baby shower. One of the advantages of using a baby shower checklist is that it ensures that you do not forget anything. Unless you choose to intentionally forget it. 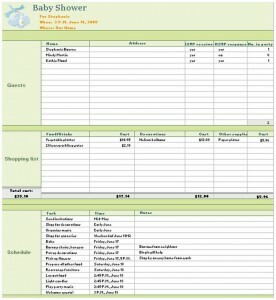 This is a baby shower checklist that keeps track of your guest list, budget, party schedule and shopping list. With this method, you can be sure that you will not forget anything. A baby shower checklist will also help you to organize your baby shower. The best part is that it is free to download, and it is customizable. The first thing that you need to do is fill in the customizable data. This will help you to organize your shower, and help to make it better. The more detailed information you have, the better. Calculate your budget and how much you can spend on your baby shower. This will ensure that you do not go over the budget, and you save some money in the long-term. Plan your party schedule. For example, what do you plan on doing at the party? Planning the events ahead of time ensures that you have all the ideas ready so that it is not a boring party. The more organized, the more peace of mind that you will have. That is one of the advantages of having a baby shower checklist. Plan everything into the budget. This will include invitations, decorations, games, gifts and a table centerpiece. Don’t be afraid to add your own special touch to the baby shower. This is going to help make it feel like it is your own. The best baby showers are the unique ones. When planning a baby shower, sometimes it is better to keep things simple to avoid stress. A baby shower checklist gives you peace of mind. This is because a simple plan ensures that you will not get off track.